Beer shop with on-license in Chesham, run by the Mad Squirrel brewery. There's another larger branch in nearby Amersham. 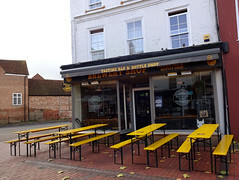 This one was previously known as the Chesham Brewery Shop, but rebranded to Mad Squirrel Chesham when the parent brewing company rebranded from Red Squirrel to Mad Squirrel. It's fairly spare inside, with bare boards on the floor. Shelves near the door hold bottled beer, cider, and wine, and there's a small bar further back in one corner. Keg and cask beers are dispensed from taps mounted through a board at the back of the bar. All is available for both drinking in and taking away, and they have "growlers" (large refillable containers) on sale for the draft beers. There's some interior seating by the front windows, and standing room by the bar, but the majority of the seating is out the front on the semi-pedestrianised Market Square. Kake visited on a Wednesday afternoon in September 2015. When I got there around 4:15pm there were already a fair few people in, some standing at the bar and about half a dozen sitting outside, and an hour later all the seats were taken, inside and out. There were eight beers and two ciders on offer, some cask and some keg, including Dancing Duck Dark Drake (£2.95/pint, £1.60/half) and Red Squirrel Mr Squirrel (£2.50/pint, £1.40/half). They don't seem to do any food other than crisps, but seem to be fine with you bringing your own — on our visit, one of the groups sitting outside were enjoying a selection of Greggs pasties. Accessibility: No steps to get in, or to the toilets. Very little interior seating. Last visited by Kake, September 2015. Opening hours taken from the Mad Squirrel website, July 2017. Last edited 2017-10-22 16:17:04 (version 6; diff). List all versions. Page last edited 2017-10-22 16:17:04 (version 6).